Kids and adults alike love the cheesy flavor of these savory bites. Snack from the bag, or add them to your favorite gluten-free mix. My 11 year old daughter and myself can NOT tolerate gluten, she was DEVASTED!!! She has handled it very well except for wanting fish crackers REALLY BADLY!! We must say these crackers are AMAZING!!!! My other daughter who is NOT gluten free even prefer's these crackers!! They are delicious!! These are fantastic! My 3 year old has celiac and I was looking for a substitute to Goldfish Crackers. These are far better! Great texture and taste! OMG these are sooooo GOOD! I seriously can't stop eating them once the bag is open! Holy moly, these are good!! I have Celiac and I never thought I would get to have anything like this ever again. 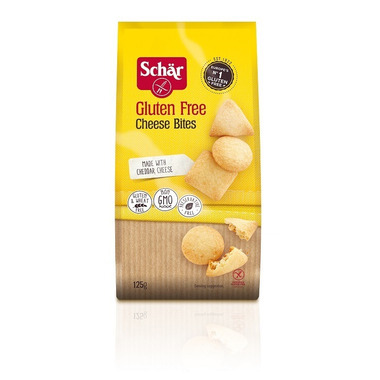 Dr. Schar treats are not sad, second-rate replacements of the original gluten-free versions of snack food; they are real-world, actually-delicious, Celiac-friendly lifesavers! Tasty! Anyone with a peanut allergy should avoid these though due to the lupin flour (some people who are allergic to peanuts may also react to lupin).